Web content has been my life ever since I graduated. Full time webmaster. Part time blogger. Enthusiastic web admin. Accepting adverts and review at the moment. Also available for paid blogging job. I blogged about everything that I encounter be it lifestyle, fashion, food, travel and review! 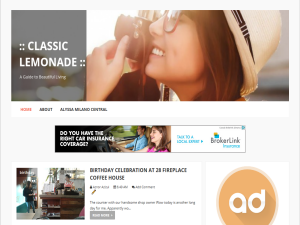 This what your Classic Lemonade Blog Ad will look like to visitors! Of course you will want to use keywords and ad targeting to get the most out of your ad campaign! So purchase an ad space today before there all gone! If you are the owner of Classic Lemonade, or someone who enjoys this blog why not upgrade it to a Featured Listing or Permanent Listing?